Per IEVS, Toyota sold/leased 269 Mirais in the U.S. in December, for a total of 1,835 for the year. This total doesn't agree with last month's, as at that time IEVS claimed 1,542 YTD, + 269 = 1,811. Perhaps they updated the old number. Guy [I have lots of experience designing/selling off-grid AE systems, some using EVs but don't own one. Local trips are by foot, bike and/or rapid transit]. The 'best' is the enemy of 'good enough'. Copper shot, not Silver bullets.
. . . As Toyota kicked off its participation in the Montréal International Auto Show, the company confirmed it would launch starting with select fleets in Québec. Hydro Québec is the world’s fourth-largest producer of clean hydro-electricity; the hydrogen used to drive Mirai will be produced from clean sources too. Toyota Canada has been working closely with partners in Québec over the past year—in particular, the Ministries of Energy, Environment, and Transportation—to ensure the introduction of an appropriate fueling infrastructure in the province. . . . Per a comment, this apparently starts with 50 cars used in commercial/industrial fleets around Quebec City for a cold weather test, then expanding to the public and the rest of the Province later.
. . . Thirty-one retail hydrogen stations are now open for business in California, with an additional twelve stations projected to open in California in 2018. Toyota continues to partner with FirstElement Fuels and Shell to support the creation of a broad network of hydrogen infrastructure in California. Toyota is also collaborating with Air Liquide, a producer of industrial gases, to set up a network of 12 hydrogen fueling stations stretching from New York to Boston, with the first station expected to launch in Boston later this year. In addition, Toyota is building a new Tri-Gen facility at the Port of Long Beach that will use bio-waste sourced from California’s agricultural industry to generate water, electricity and hydrogen. The hydrogen will fuel all Toyota fuel cell vehicles moving through the Port, including new deliveries of the Mirai sedan and Toyota’s Heavy Duty hydrogen fuel cell class 8 truck, known as Project Portal. . . . The last paragraph has its own topic. utility if converted to a homeless shelter for the South Bay. InsideEVs wrote: The Japanese automaker spent tons of cash and time (since the early 1990s) on the research and development of FCVs. Today, it must continue to decide whether to invest even more in both the infrastructure roll-out and vehicle development. Performance of hydrogen-powered vehicles is less than desirable, while prices are extremely expensive. Added to this, there is no refueling infrastructure for mass-adoption. Toyota has yet to have any notable sales success related to the technology. The automaker delivered just ~4,500 Mirai since late 2014. U.S. sales of the Mirai have just exceeded 3,000. InsideEVs wrote: Toyota’s goal to achieve sales of 30,000 FCVs annually by 2020 is highly doubtful (BEV targets for single models already exceed 100,000+). InsideEVs wrote: Plug-in cars — battery-electric in particular — are easier to introduce both on side of car manufacturer (though some are faring better than others), as well as in terms of available infrastructure, which is growing rapidly. Meanwhile, there are only 91 hydrogen stations in Japan and around 30 in California. Studies show that consumers are also beginning to show much more interest in plug-in vehicles, and the numbers don’t lie. 10K mi. on 041413; 20K mi. (55.7Ah) on 080714; 30K mi. (52.0Ah) on 123015; 40K mi. (49.8Ah) on 020817; 50K mi. (47.2Ah) on 120717; 60K mi. (43.66Ah) on 091918. Road and Track called it the ugliest car ever and I agree. GlennD wrote: Road and Track called it the ugliest car ever and I agree. Umm.. This IS still the same universe that spawned the AMC Pacer, Citroen DSes, and Karmann Ghias, isn't it? 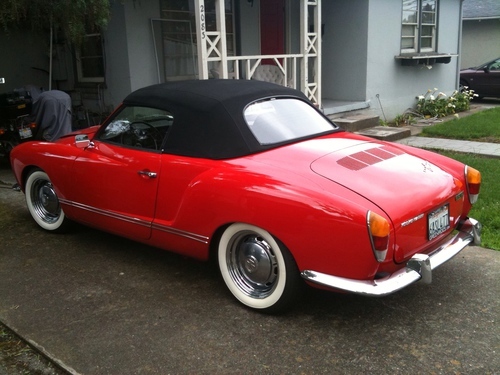 I liked my 59 karman ghia, Compared to a regular VW it was tons better. It was 6V and my 2 way radio turned the headlights orange when I keyed up. GlennD wrote: [ liked my 59 karman ghia, Compared to a regular VW it was tons better. It was 6V and my 2 way radio turned the headlights orange when I keyed up. But the topic was aesthetics, not function. I always felt ghias look like VW beetles that got left out in the sun to melt. Sorry, GRA, I couldn't find an H2 FCV conversion kit for a Karmann Ghia.